Call Astro Air Inc. if you are looking for excellent air conditioning contractors in the Boynton Beach area. Our highly skilled technicians are trained and equipped to handle any job. They have years of experience installing, repairing, and maintaining air conditioning systems of all makes and models. We offer top quality and high–efficiency products, and we will be happy to help you pick out the right AC unit for your home. We can also give you our expert advice on saving energy and lowering your utility bills. We proudly offer heating and air conditioning systems by Carrier and Ductless Systems by LG, Samsung, Mitsubishi, Sanyo, QuietCool. We service all makes and models, including Bryant, Goodman, Carrier, Florida Heat Pump, First Company. Our customers are always our priority, and our loyal clients have continued doing business with us because they know how dedicated we are to providing superior customer service. Call any time to find out why more area homeowners depend on us for all of their air conditioning needs. Did you know that your air conditioning system’s efficiency is impacted by more than its SEER rating? Proper sizing has a big impact, as an air conditioner that is too small will not cool your home adequately, and one that is too large will turn and on off frequently. Improper unit location, leaky ducts, and lack of insulation can reduce your air conditioner’s energy efficiency. An HVAC contractor can help you determine how you can get the most out of your system. Our expert heating and cooling technicians serve our customers with integrity, and we will always install your new AC unit with a high attention to detail. When we install your new air conditioning system, you can rely on us to get the job done with efficiency and precision. We are always willing to thoroughly explain any service that we provide so you can be sure that you are getting exactly the system you were looking for. Replacing your air conditioning system is a significant decision, and we are always pleased to walk you through this process. We offer only top quality brands and some the most efficient AC models on the market. You want to make sure you speak with a knowledgeable and skilled HVAC contractor to avoid issues like oversizing and improper installation. Both oversized and poorly–installed units put extra stress on your air conditioning system and can wear down the components or cause a system failure. For the most experienced heating and cooling professionals in the region, call us today to discuss your AC replacement options. We are happy to go over all of our AC products and services. As with any HVAC system, routine maintenance is an important part of extending the life of your air conditioner and preventing costly repairs or hazards. Air conditioners have delicate components that need regular cleaning and inspections, and there are precise measurements to correctly charge the unit with refrigerant. You should only hire a qualified heating and cooling technician to maintain your air conditioning system. Call us if you are looking for expert AC maintenance service in the business. From emergency air conditioning repairs to charging the refrigerant, our expert technicians can handle any AC repair. We get the job done efficiently and safely without damage or unnecessary disruption to your home. Call us as soon as you notice a problem with your air conditioner. We can help prevent further damage or safety hazards the sooner we respond to your AC system repair needs. We respond to emergency repairs quickly so that we can get your air conditioning back on as quickly as possible. If you aren’t sure whether or not you need an air conditioner repair in Boynton Beach, FL, call one of our technicians to help you troubleshoot or provide professional advice. The qualified HVAC technicians at Astro Air Inc. are always happy to help you with any AC service. We have the skills and experience it takes to get the job done right. We serve all of West Palm Beach area, and we are here to take your call. The installation of a new air conditioner in your home should be handled by a reliable Boynton Beach area HVAC contractor. 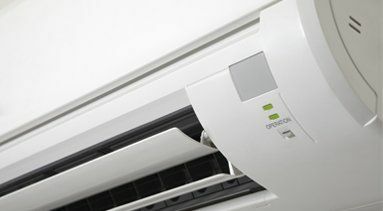 Air conditioners that have been installed improperly or that aren’t installed on a level surface will begin to make loud noises and prematurely wear down the components. Installing new components incorrectly can also cause problems for you in the future. We proudly offer heating and air conditioning systems by Carrier and Ductless Systems by LG, Samsung, Mitsubishi, Sanyo, QuietCool. We service all makes and models, including Bryant, Goodman, Carrier, York, Rheem, Ruud, American Standard, Lennox, Florida Heat Pump, First Company, Luxaire. Customers trust Astro Air Inc. because of our outstanding reputation for customer satisfaction and quality products and services. We are here to answer your questions or discuss our air conditioning installation services and top of the line products. Contact today and let us know how we can help you! Give us a call or fill out our quick and easy form to schedule air conditioning installation in Boynton Beach, FL and the surrounding area. If you are buying a new home, you should look for features that will keep your heating and cooling costs low. Energy efficient windows and doors, adequate insulation, and a correctly sized HVAC will help keep your utility bills down. New, ENERGY STAR rated air conditioning and heating equipment will also make a big difference. If you have any questions about the condition of your HVAC system, give us a call today! Whether you need to replace an old air conditioner that is beyond repair, or if you want to install a new high–efficiency AC unit to save more energy, you should speak with our air conditioning specialists to find the best cooling solution for your home. When you call to speak with one of our HVAC experts, we will work within your budget to help you find the air conditioning system that best fits your needs. Unlike some air conditioning contractors, we never try to sell you a unit that you don’t need or want. Choosing a new air conditioner is one of the most important decisions you have to make as a homeowner, and it is a significant investment. We will make sure you choose the AC system that will be worth the initial cost, both in terms of efficiency and longevity. Our energy–saving products are durable, reliable, and some of the most cost–effective air conditioners on the market. Call any time to learn more about our air conditioning systems. When you decide to install a new air conditioner, there are a number of things to consider before settling on a specific model and type of air conditioner. Central AC units and heat pumps are commonly installed to work with existing air ducts and ventilation systems. You can also choose to install ductless air conditioning systems if you don’t have ductwork. If your current system runs on electricity, you may find that a system that uses natural gas is more cost–effective. We can help you decide what type of air conditioner and unit size is right for your home. Don’t hesitate to call us if you have questions. All new air conditioning systems are given a SEER rating or awarded with an ENERGY STAR label to make it easier for homeowners to choose the most efficient model within their budget. The seasonal energy efficiency ratio (SEER) measures how much energy is used to cool a particular space. Air conditioners that were manufactured after January 2006 have a minimum SEER rating of 13, but before 2006, the minimum SEER rating was 10. If you have an air conditioner that is older than 15 years, you’ll want to think about an upgrade, since many older models have SEER ratings of 6 or less. Installing a new high–efficiency air conditioning unit could cut your cooling bills almost in half. Feel free to contact us if you would like to learn more about saving energy and lowering your utility bills. When you need a new air conditioner installed in your home, we are the contractors to call in the West Palm Beach area. We have some of the most knowledgeable professionals in the business on our team, and we will install your new unit with very little disruption to your home. Start saving energy today! Call Astro Air Inc. to install a brand new high efficiency AC in your home. Your air conditioner has a lot of responsibility to keep you cool and comfortable,especially in southeast Florida, where temperatures can get really hot in the summer. If your air conditioner has broken down and is several years old, the time is right for air conditioning installation services in Delray, FL. Astro Air Inc. is your local source for efficient and fast installation services. Astro Air Inc. has offered affordable and high-quality HVAC services since 1986. As air conditioners have gotten more advanced, so have our installation techniques. Also,as a family-owned business, we always provide fair and honest prices for our services,and we always treat you with respect. When you need air conditioning installation in Delray, FL, or Boynton Beach, FL,call us. It's been repaired multiple times. It doesn't cool the house efficiently. It's a decade old or older. Also consider calling a professional if your air conditioner makes strange noises, leaks, or emits foul smells. At Astro Air Inc., we can inspect your air conditioner and either make the necessary repairs or recommend a new installation. Why Should You Choose Astro Air Inc.? For complete air conditioning installation services in Delray, FL,call us at 561-738-0077. You can also schedule service or a free estimate online. The AC technicians at Astro Air Inc. are here to help you with all of your AC replacement needs. Whether you are replacing your entire air conditioning unit, or you need replacement parts, we’ve got you covered. We will show up to your home on time and prepared for any job. If you live in the Boynton Beach area, call us any time for emergency repair, because we also offer comprehensive AC repair services, and we will provide our honest opinion about whether or not you need to replace your unit. Today’s HVAC market features a wide variety of high–efficiency and ENERGY STAR air conditioners and heat pumps. While you might assume that you need to replace your old air conditioner with the exact same type of system, there are actually now a wide variety of air conditioning system options available. Don’t settle on a system until you’ve talked to one of our AC experts about which systems will best meet your home comfort needs and budget. If you have central air conditioning, you will want a professional HVAC technician to inspect your duct system. Depending on the condition of your air ducts, they may need replacing before your actually cooling unit. Be sure to ask questions when we assess your current air conditioning and ventilation system and let us know about any issues you’ve noticed. We are always happy answer questions and discuss your options to help you select the best new air conditioner for your home. Opting for ductless AC units may be your best choice if your existing air ducts aren’t in good condition. These are also called mini–splits because unlike traditional split–system central air systems, they do not cool the home with ductwork; instead they heat individual rooms and so they can be big energy savers. Call us any time if you would like to know more about the types of air conditioning systems that we offer. Did you know that in order to earn the ENERGY STAR label, your air conditioner doesn’t just have to meet certain standards for energy efficiency? It also needs to deliver the features and performance that consumers want, to ensure that you are not sacrificing effectiveness for efficiency. While ENERGY STAR qualified products might cost more than less efficient products, they have to be able to recover that cost difference in increased savings on your energy bills. ENERGY STAR rated air conditioners are a great investment, talk to an HVAC contractor today to learn more! Determining whether or not you should replace your air ducts will depend on the condition they are in and what type of air conditioner you want to install. Many older AC units were oversized due to the fact that many homes had inefficient ductwork, poor insulation, and a significant amount of air leaks. If you’ve had a new home built, or you’ve upgraded your older home by installing a new duct system or adding insulation, you’ll want to make sure you choose a unit that has a capacity to match your home’s needs. Homes that are too tightly sealed don’t require an AC unit with an especially high capacity. When you upgrade your air conditioning system, you may want to also think about installing a programmable or wireless thermostat to help you save even more energy. Digital thermostats are now becoming the standard in temperature control because of their accuracy and ease of operation. When you install a programmable thermostat, you are getting more cost–efficiency from your new system because they allow you to program different temperature settings throughout the week. You can find basic models to highly advanced ones with multiple settings and wireless options. We are happy to install a new thermostat for you, even if you aren’t installing a new air conditioning unit. When we install or replace your air conditioning system, you can trust that your system will last for many years. Our qualified technicians do everything they can to ensure that the unit is installed properly so that you don’t have issues in the future. We also want to help make your home more efficient, and that’s why at Astro Air Inc., we offer the most efficient products and help you decide which AC unit is best for your needs. Contact us at any time if you would like to learn more about the products and services we offer in the West Palm Beach area. Maintaining your home’s central air conditioning system is easy when you call Astro Air Inc. Our Boynton Beach area AC technicians can handle any maintenance service, and we offer the most comprehensive inspections in the region. If you need to schedule your annual air conditioning tune–up, give us a call today. We’re always happy to answer questions or provide maintenance tips. Call us today to schedule air conditioning maintenance service in Boynton Beach, FL and the surrounding area. The key to preventative maintenance for your AC is ensuring proper airflow. When the airflow is blocked, your air conditioner cannot work as efficiently, which raises your energy costs and wears down the parts. This is why changing filters, cleaning the coils, and clearing debris away from the outside components are among the most important maintenance tasks for homeowners. If you aren’t sure where to locate your air filter, call one of our technicians. We should be able to tell you according to the brand and model number. Most air filters are located in wall or ceiling vents, or on the unit itself. Filters come in various sizes and efficiency levels, but you should buy the type of filter recommended by the manufacturer. Most manufacturers recommend changing or cleaning your air filters once a month during times of high use, especially if you have pets. Some filters only need to be changed every three months. Check the packaging if you aren’t sure how often to change it. Did you know that your air conditioner needs regular maintenance to continue to work efficiently? Even if you have a brand new system, the air filters, coils, and fins need to be cleaned and inspected regularly for your AC to cool effectively. Neglecting maintenance will lead to a decline in performance and an increase in the amount of energy your unit uses. Scheduling annual service with a trained professional is necessary to get the most out of your air conditioner, but that doesn’t mean there aren’t some things you can do on your own. To promote maximum energy efficiency, avoid major problems and generally extend the life of your system, one of the most important things you can do is keep your evaporator and condenser coils clean. While air filters prevent the coils from getting soiled, your AC coils will collect dust and dirt over time. Always turn off the power to your air conditioner whenever you clean the coils. If the electricity is left on, you run the risk of electric shock or other serious injuries. The indoor evaporator coils should be cleaned at least once a year since they will lose its ability to absorb hot air inside the home if they dirty. Because the outdoor condenser coils are exposed to the elements, they should probably be checked and cleaned more often. Make sure you rake anything that could get trapped in the fins and clog the system, which includes lawn clippings, twigs, and leaves. Try to trim any nearby bushes or trees to minimize the risk of the limbs blocking the airflow to the outdoor components. If you have a packaged unit, both sets of coils will be located in the same place with the rest of the components. Call us if you need to know how to locate and clean your coils. Even if you provide exceptional care for your air conditioning system, you will still need an HVAC specialist to perform a routine inspection and cleaning at least once a year. Many homeowners neglect to do this for a number of reasons. Most of the time, the reason is that the homeowner has just installed a new unit or there hasn’t been any problems with the AC. Although you may not have needed repairs or had any issues with your air conditioner’s performance, there could be hidden problems or warning signs. Safety hazards are another concern that a professional can look for during one of these inspections. We thoroughly check every component for loose parts, faulty wiring, or anything that could create a hazard. We can also suggest ways for you to increase efficiency and ensure that your unit runs safely throughout the season. Don’t wait until your air conditioner stops working because of something we can take care of during a yearly check–up. Call today to schedule your annual maintenance visit. The professionals at Astro Air Inc. are here to help, no matter what you need for the air conditioning system in your home. From installation to emergency repairs, our expert technicians can handle any AC job in the West Palm Beach area. Remember that preventative maintenance is the best way to reduce the risk of hazards and costly repairs, so give us a call any time to set up an appointment. Call Astro Air Inc. any time you need air conditioning repair in Boynton Beach, FL. Our technicians are reliable, efficient, and highly skilled for all of your air conditioning needs. We make sure that all of our HVAC technicians have the right tools and training for any AC repair in the Boynton Beach area. Customer satisfaction is important to us, and we make sure to meet and exceed your expectations. Call immediately if you live in the Boynton Beach area you need an emergency AC repair. We will send someone to your home as quickly as possible. We’re here to help you in any way we can, so call any time or fill out our quick and easy form to schedule air conditioning service in Boynton Beach, FL and the surrounding area. There a few different reason why your AC might not be cooling your home effectively. If you have clogged air filters, it can cause problems with air flow, and your forced air system will be unable to cool your home. If no cool air is coming out of your vents, check your air filters to make sure they are not clogged with dust and debris. Regularly changing your air filters will help your system work efficiently and help keep your home cool all summer long. The evaporator and condenser coils should be cleaned regularly to keep your AC running efficiently and safely; however, the coil fins are sometimes damaged or bent. Our technicians carry fin combs designed specifically to repair damaged coil fins. This type of service is important if you see damaged coil fins because they can restrict airflow. Our AC technicians can also measure the airflow through the coils to ensure that there’s nothing else restricting the airflow. Call us today if you think you have a bent coil fin, or if you notice that any of the coil fins are broken. Another reason to regularly maintain your AC unit is to prevent a compressor failure. The compressor motor is an important part of your air conditioner because it transfers the refrigerant between the indoor and outdoor coils. Nine times out of ten a failed compressor cannot be repaired and will need to be replaced. A compressor can fail in a number of ways, some of which can cause other major damage to the rest of your air conditioning system. Faulty wiring, worn bearings, or malfunctioning pistons and valves can cause a compressor to lock up or burn out. Compressor failure can be a symptom of a serious problem depending on the cause, so call us as soon as you notice any issues. Not only is there a potential for a fire or other safety hazard, but we may also be able to prevent the failed compressor from damaging the rest of the components if we catch it early on. You can also reduce the potential for problems with the compressor if you schedule a yearly exam. During these visits, our qualified HVAC technicians will lubricate the bearings and other components that can wear down and damage the compressor. Call immediately if you suspect an issue with your compressor or if you have questions about how to detect compressor problems. When your air conditioner shuts down, there could be a variety of causes, and some of these could be minor. Clogged air filters, blown fuses, and loose connections can cause the system to stop working unexpectedly. No matter what caused your unit to fail our technicians are equipped and prepared to resolve the problem and get your AC working again. If it is an issue that is not serviceable, such as a failed compressor, we can provide you with the best advice on a system or part replacement. We never try to sell you anything you don’t absolutely need, and we keep your safety in mind at all times. Call us as soon as your air conditioner shuts down. We will send someone to your home as quickly as possible. Call the Boynton Beach AC Repair Experts Today! Our Boynton Beach area customers know that they can depend on us when they are having problems with their AC, no matter what style or model they have. The qualified technicians at Astro Air Inc. are trained to handle any air conditioning repair service, including emergency repairs and system failures. Don’t hesitate to contact us for any of your air conditioning repair needs. Give us a call or fill out our quick and easy form to schedule AC repair service in Boynton Beach, FL and the surrounding area. Air conditioning is essential to a comfortable and cool home. However, if your AC unit is broken, then you need repair. Astro Air Inc. offers AC repair services in Delray, FL, so that we can restore the cool air that you deserve in your home. When you need AC repair in Delray, FL, our technicians have your back. We understand the importance of a fully functional air conditioning system for your home or business so we provide quick and efficient repair services. Rather than focusing on other aspects that will not truly repair your AC unit, we work closely with you to identify the true problem with your system so that our repair services solve the core issue. Whatever your AC repair needs are, we provide the services that you need to get your air conditioning system back up and running. Our technicians provide the repairs that your system needs, whatever the brand, make,and model. We also train our staff on the latest insights into AC repair so they are in the best possible position to serve you. We know that dysfunctional air conditioning units try your patience and comfort. Our goal is your complete satisfaction,and we strive to bring that to pass with our stellar commitment to customer service. Your comfort is our success. Contact Astro Air Inc. today. Schedule your AC repair services in Delray, FL, with our online form and be one step closer to having cool, refreshing air in your home. At Astro Air Inc., we offer top of the line thermostats to help you save energy and lower your utility bills. If you want to save money on your monthly energy bills, it’s important to help maintain the efficiency levels of your heating and cooling systems any way you can. This includes keeping your home at reasonable temperatures so that your unit doesn’t work harder than it needs to. Digital, programmable, and wireless thermostats are affordable and easy to use energy–saving tools. Give us a call if you live in the Boynton Beach area and you have questions about upgrading your old dial thermostat for more precise temperatures and better energy savings. If you want to install a new thermostat, you’ll need to consider all the different models on the market today. New thermostats range in price and setting options, so you’ll want to decide what is most important to you, whether it’s saving energy or ease of operation, or both. Any digital thermostat will give you a much more precise temperature control than mercury dial thermostats typically found in older homes. Wireless models are ideal for zone control systems, so you’ll definitely want to think about installing wireless thermostats if you want to be able to have temperatures vary in different parts of the house. Ask one of our technicians if your current AC unit is compatible with zone control systems. We are happy to discuss all of your options and help you choose the best new thermostat for your home. Did you know that location of your thermostat can have a big impact on how effectively your heating and air conditioning system works? Thermostats that are placed in drafts or direct sunlight can get "ghost" or incorrect readings that can cause your air conditioning or heating system to cycle unnecessarily. A contractor can help you pick the right place for your thermostat, and they can also make sure it is properly calibrated. Even if you aren’t replacing your old AC unit, installing a new thermostat can help you cut down on energy bills. Programmable thermostats are less expensive than they were even a few years ago because of the advancements in technology and their increased availability. You can find the most basic models at a reasonable price. On the higher end, new programmable thermostats come with advanced settings that make it even easier to control temperatures according to your daily or weekly schedule. You may want to install wireless thermostats in several different rooms for a more customized approach to climate control within the home. If you have an older AC system, you’ll need to also make sure that your system will work with more than one thermostat. Call us if you have questions about maintaining comfortable temperatures with a new thermostat. While many electronic thermostats are fairly easy to install, you should not attempt to install your new thermostat if you aren’t comfortable with home projects that involve electrical wiring. If it is installed incorrectly, it could damage the wires or cause a fire. You could also seriously injure yourself, so it’s best to call a professional to properly install your thermostat. Our qualified technicians can install any type of thermostat and walk you through how to operate your new device. Give us a call any time if you would like to set up an appointment for an installation service. Get the Most from Your HVAC System: Call Us Today! Whether you are installing a new heating and cooling system or you want to help save energy with your current HVAC unit, call Astro Air Inc.. We can go over all of the energy–saving products that we offer and provide expert advice. We can also install your new thermostat once you’ve chosen the one that fits your lifestyle and comfort needs. Start lowering the energy bills in your home today! Call us and ask to speak with one of our West Palm Beach area HVAC experts about our top quality thermostats and installation services. Variable Refrigerant Flow (VRF) systems are the most cost–effective HVAC systems available today. Air source VRF systems are designed to save on operation costs because, for the most part, they can operate without the use of large air handlers or ductwork. They are efficient because there’s no air loss through the duct system, and they offer on demand heat or air for individual zones, which reduces energy consumption. In addition to their efficiency, they are also easier to install and maintain, which is part of the reason they have the lowest life cycle and operation costs of any heating or cooling system on the market. At Astro Air Inc., we install, repair, and maintain VRF systems for customers in the Boynton Beach area. Whether you own a small office or large commercial building, let us show you how you can save on your energy bills and operation costs by installing a VRF system in your building. Call today! How Does a VRF System Work? The term variable refrigerant flow simply means that this type of HVAC system can control the amount of refrigerant sent to each evaporator, which will have its own capacity and setting for the comfort in that particular zone or room. Models with inverters and dual compressor outdoor units can support the use of multiple zones at once while preventing constant cycling or large temperature swings. This type of precise load matching ensures efficiency, comfort, and proper dehumidification. VRF systems are also designed to provide the option of turning off the zones that are not in use. In traditional forced air HVAC systems, shutting off vents in unoccupied rooms constricts the airflow making the AC less efficient, and it wears down the components prematurely. Because VRF systems don’t use ductwork, fans, and dampers to distribute the air, they are a lot more efficient than forced air HVAC systems. The efficiency of VRF systems not only reduces energy use and lowers utility bills; it’s also a more sustainable way to cool large buildings, which also reduces your carbon footprint. Because of the lower energy costs and sustainability, more and more business owners are choosing to install VRF systems, whether it’s in a new construction or a remodeling job. VRF systems are also ideal for retrofitting older buildings with minimal disruption. Variable refrigerant systems also allow you to cool multiple zones at the same time because of the variable speed compressors. Another major benefit is that they are easier to maintain and operate than forced air systems. Typically, the two major maintenance tasks for a VRF system are cleaning coils and changing filters, and they are also quieter because they have fewer components. In addition to these benefits, variable refrigerant systems are space savers. Unlike standard split system AC units, the main compressors for VRF’s are installed outside the building, eliminating the need for an equipment room. Call Astro Air Inc. any time if you would like to know more about VRF systems and the products we offer. We’re happy to go over your options and put together an installation plan. When you’re ready to start saving money and invest in a more sustainable HVAC system for your business, call to speak with one of our West Palm Beach area heating and cooling experts. Zone control systems are a great way to save energy and maintain different temperatures throughout your home. Heating or cooling an entire house at the same temperature can be wasteful, especially given parameters such as the design of the home, location of doors and windows, and how well the home is insulated. A zone control system will allow you to save energy and lower your heating and cooling bills, and it works with any type of heat pump or central AC. If you are thinking of installing a zone control system in your home, call Astro Air Inc.. We can help you choose the right system for your home, and we offer quality zoning installation services in the Boynton Beach area. Call to speak with one of our expert staff members if you have questions or would like to set up a consultation. Because zone control systems allow you to control specific temperatures for each "zone" or area in your house with a separate thermostat, you can customize each area to fit individual preferences for everyone in the home. In addition, your entire HVAC system will be more efficient, which minimizes repair needs since the system doesn’t have to work as hard. Perhaps the largest benefit is the money you’ll save on heating and cooling your home. Call us if you would like to learn more about how a zone control system can benefit you. Zone control systems are a great way to save energy and keep your home as comfortable as possible. However, just like everything else, your zone control dampers can occasionally break. If a zone control damper isn’t opening or closing, the two most common causes are a failed motor or a thermostat malfunction. If you notice that your zoning isn’t working like it should, call a professional to examine your system. Zone control systems work with forced air systems by using various thermostats all connected to a control panel that control dampers in the duct system. This allows the correct amount of heat or cooled air to be distributed to a particular zone, which means you can install a zone control system with your current HVAC system. Electronic duct dampers also allow you to save money by closing off zones that are not being used, in addition to creating shorter cycle times for your system since it will not take as long to heat or cool the areas where air is being distributed. Zone control dampers are specifically designed to prevent air loss through leaks in the seal. Depending on how many zones you want, you’ll need to think about the number and type of thermostats to install. Programmable and wireless thermostats work best with zone control systems to provide you with more flexibility and energy savings. When you call us to discuss installing a zone control system in your home, one of our heating and cooling experts will gladly go over the different thermostat models that we offer. Feel free to call us any time if you have questions about any of our products and services. At Astro Air Inc., we can take care of all your HVAC needs, from installation to repairs. We are glad to help you choose a zone control system that fits your needs and stays within your budget. We are sure to have a system that works with your current heat pump or air conditioner, and we can have it installed in no time. We can also repair your current system if something has gone wrong with it. Don’t hesitate to call us any time if you have questions or need a repair. We proudly install zone control systems in homes in the West Palm Beach area, so call us for all of your home temperature control needs. Understanding how your air conditioner works can help you maintain your unit and detect problems early on. To do this, you must first become familiar with the various components. If you have a traditional split–system air conditioner, your unit is broken up into two main parts—the indoor and outdoor components. The main indoor component is the evaporator coil, while the outdoor unit consists of the compressor motor and the condenser coil. Packaged units house the three main components in one cabinet, usually outdoors. If you have a traditional split–system heat pump, it will consist of the same indoor/outdoor components. Heat pumps and central air conditioners distribute the cooled air through a system of ducts within the home. Ductless mini splits, on the other hand, can cool individual rooms through separate units installed in places where the vents would otherwise be located in a split system. If you are not sure how to locate these components, just give us a call. Before you begin any HVAC cleaning project, turn off all power to the unit. The easiest way to do this is to turn it off at the breaker box, but if you aren’t sure, call us to guide you through it. Once all the power is turned off, start with the outside unit by taking off the lid or grate. You’ll need a screwdriver or drill to do this. Be sure to keep track of anything you take apart and take note of how everything is installed so that you can put it back together properly. Clean out any dirt, leaves, or other debris that you can see inside the condenser. It’s best to use a shop vacuum if you have one. Use a garden hose to spray the grill, working your way from the inside out, but make sure you don’t get the motor or other electrical components wet. If anything looks corroded, spray it with a lubricant, and call a technician to make sure it’s not serious. Replace the protective grate, and make sure you clear the grass and weeds from around the outside unit to maintain proper airflow. To clean the inside component, open the front panel and clean the coil with a mild cleanser (call us if you aren’t sure what to use). Also, vacuum out any heavy dirt or debris if you can, particularly near the drain. Overall, make sure there’s nothing that could block the air from flowing freely between the indoor and outdoor components. When you properly maintain and care for your home air conditioning system, it will run more efficiently. 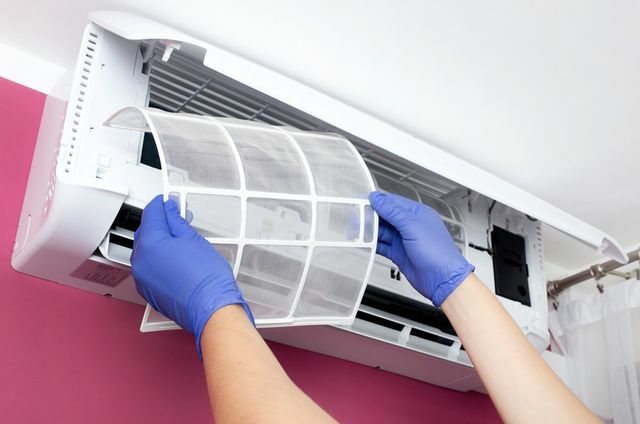 Maintenance for your AC unit extends beyond simply changing the air filters. You should also pay attention to how your system operates. Is it making loud noises? Does it have trouble starting, or is it cycling on and off more than usual? Detecting any problems early on can help you save on repair costs. Addressing minor issues early on can help you avoid breakdowns that lead to expensive repairs. Are there obvious damages, such as a bent fin? These are all questions you should keep in mind to help you maintain your unit and prevent costly repairs or system breakdowns. Remember that maintenance equals efficiency!